Use your computer without the need to start it up: a new type of magnetic memory makes it possible. This 'MRAM' is faster, more efficient and robust than other kinds of data storage. However, switching bits still requires too much electrical power to make large-scale application practicable. Researchers at Eindhoven University of Technology (TU/e) have discovered a smart way of solving this problem by using a 'bending current'. They publish their findings today in the journal Nature Communications. MRAM (Magnetic Random Access Memory) stores data by making smart use of the 'spin' of electrons, a kind of internal compass of the particles. Since magnetism is used instead of an electrical charge, the memory is permanent, even when there is a power failure, and so the computer no longer has to be started up. 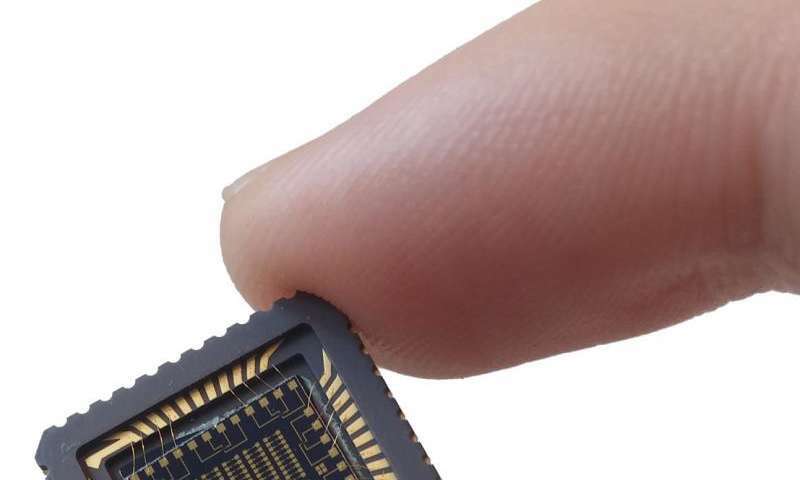 These magnetic memories also use much less power, which means that mobile phones, for example, can run longer on a battery. 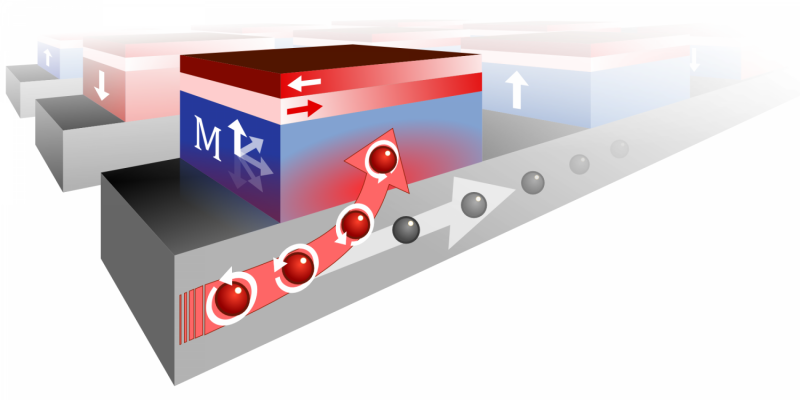 In a MRAM bits are projected by the direction of the spin of the electrons in a piece of magnetic material: for example, upwards for a '1' and downwards for a '0'. The storage of data occurs by flipping the spin of the electrons over to the correct side. Normal practice is to send an electrical current which contains electrons with the required spin direction through the bit. The large quantity of electrical current needed to do this hindered a definitive breakthrough for MRAM, which appeared on the market for the first time in 2006. In Nature Communications a group of TU/e physicists, led by professor Henk Swagten, today publishes a revolutionary method to flip the magnetic bits faster and more energy-efficiently. A current pulse is sent under the bit, which bends the electrons at the correct spin upwards, so through the bit. "It's a bit like a soccer ball that is kicked with a curve when the right effect is applied," says Arno van den Brink, TU/e PhD student and the first author of the article. The new memory is really fast but it needs something extra to make the flipping reliable. Earlier attempts to do this required a magnetic field but that made the method expensive and inefficient. The researchers have solved this problem by applying a special anti-ferromagnetic material on top of the bits. This enables the requisite magnetic field to be frozen, as it were, energy-efficient and low cost. "This could be the decisive nudge in the right direction for superfast MRAM in the near future," according to Van den Brink.